Facebook announced on November 22, 2011 that the Notes app will no longer autofeed your blog to your Facebook Page. Why does this matter to you? Well, if you have been using the notes application to import your blog posts, then it’s a problem. Your blog posts will no longer be sent directly to your Facebook Page. If this is something you still desire to do, than click on the picture below for a free short tutorial on how to import your blog to your Facebook Page (or Facebook personal account) via Networked Blogs. 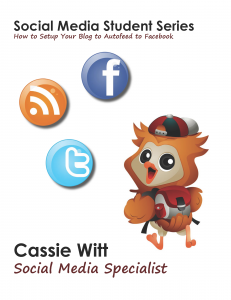 This will also allow you to auto-post your blog to places like twitter.